The device is still in its prototype stage, but the students say their goal is to give breast cancer patients the same rapid review that commonly occurs when tumors are removed from elsewhere in the body. The students learned about the second-surgery dilemma while observing medical procedures last summer as part of a year-long biomedical engineering master’s degree program. In this program, students learn to design new medical tools and products that address urgent healthcare needs. So far, the team’s system has been tested on animal tissue and human breast samples from a tissue bank, but it has not yet been used on patients. Over the past year, however, the students’ device design and market analysis have earned them more than $40,000 in college business plan prize money. 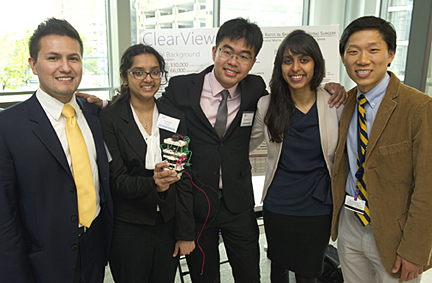 In the recent Design Day event for Johns Hopkins biomedical engineering students, the team received the top People’s Choice award. And, although all of the student inventors received their master’s diplomas in May, two have received funding to remain at Johns Hopkins and continue refining the project over the coming year. At Johns Hopkins, the pathology device was developed under the supervision of the university’s Center for Bioengineering Innovation and Design (CBID). The center teams students with faculty researchers, physicians and others who help them understand healthcare needs and guide them as they propose solutions, then build and test prototypes. 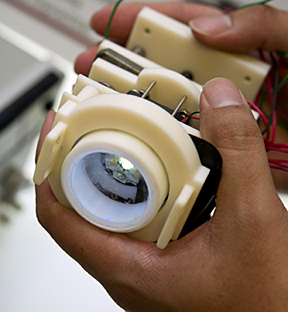 CBID operates within the Department of Biomedical Engineering, which is shared by the university’s School of Medicine and its Whiting School of Engineering. Along with Neira and Sinha, the student inventors of the breast cancer device were Qing Xiang Yee of Singapore and Vaishakhi Mayya of India. Sinha and Mayya will remain at Johns Hopkins during the coming year to continue working on the project with David Shin of Seattle, another recent graduate of the CBID master’s program. The students also will continue collaborating with advisers from the School of Medicine, including Ashley Cimino-Mathews, an assistant professor of surgical pathology, and James Shin, a surgical pathology research specialist. Jason Benkoski, a senior materials scientist from the Johns Hopkins Applied Physics Laboratory, will serve as a technical adviser to the team. The Wallace H. Coulter Foundation is providing funding for these students to continue working on the project this year.